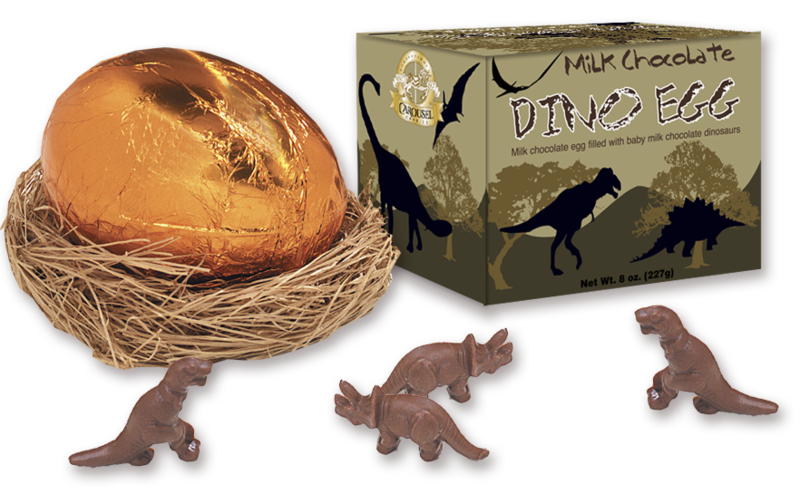 The Dinosaur Farm > Dino Toys, Plush & Merch > Chocolate Dinosaur Egg with Chocolate Dinosaurs Inside! We can’t 100% Guarantee that these eggs won’t be cracked a bit. They’re usually fine, but in the shipment to us in CA and the shipment to your house, it’s possible for them to sustain a little damage. Nothing serious, and nothing to affect the taste. The ingredients are listed as: Sugar, Cocoa, Butter, Whole Milk, Chocolate Liquor, Soy Lecithin (An Emulisifier), Vanillin (An Artificial Flavor). There is an allergy notice that states: This product is manufactured on shared equipment and may contain traces of peanuts, tree nuts, milk, eggs, wheat and soy products. Categories: Dino Toys, Plush & Merch, Party Favors & Supplies. Tags: chocolate, egg, milk, nest.